Sci-Tech (POB) Ltd. is an SME (Small to Medium Enterprise) based in the Space Cluster at Harwell. The company was formed in 2008 after the owners became the first triple winners of the European Satellite Navigation Competition, winning the UK Prize, the GSA (GNSS Supervisory Authority) prize for the best use of EGNOS, and the overall Galileo Masters prize. The prize winning concept was for a 'Man Overboard' product for the leisure boating market. We have expanded the original idea to create a ruggedised marine tracker. You can follow the story under 'POB History'. 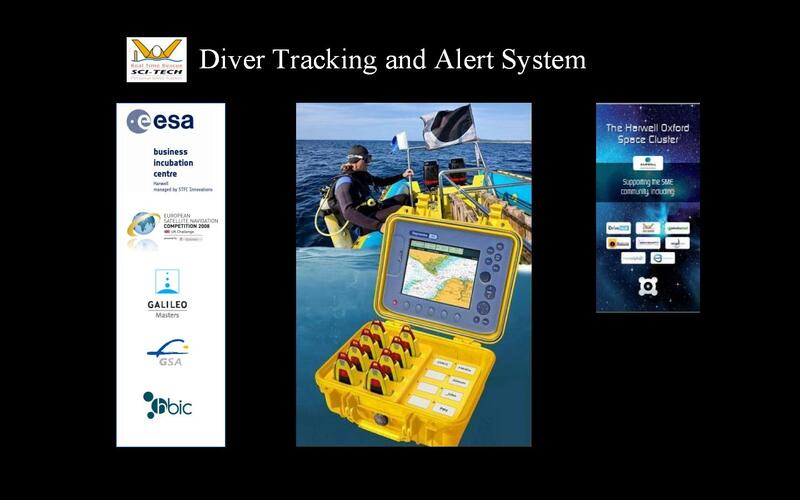 The company is now based in the Space Cluster at Harwell, Oxford, where it is nearing completion of the development of its Diver Tracking and Alert system, and supplying consultancy in GNSS enabled tracking, especially in harsh / maritime environments. Peter and Christine talk about the POB project. It gives a slice in time of the project state, just before the start of the Diver Tracker project. Watch an earlier prototype being demonstrated at the Galileo Applications Day, Brussels, in 2010. We are considering releasing our board as an OEM development system. General enquiries and more information: click here. Return to main Sci-Tech Systems Ltd site .